Winter Solstice, 12-21-12, and the Last weekend of The Market! The December solstice occurs when the sun reaches its most southerly declination of -23.5 degrees. In other words, it is when the North Pole is tilted 23.5 degrees away from the sun. To our southern hemisphere friends hope you are happy to see the “summer solstice!” It is the winter solstice only in the northern hemisphere.Either way-Hurrah for the Solstice and the beginning of LONGER DAYS again!!! The countdown to the apocalypse is on.Well sort of, we woke up and the world is still here, the world did not end as the Mayans feared it would….however, we are in some rough and turbulent times. The Fiscal Cliff- one would think that the left, right and middle could get it together and truly do what is best for the majority, the country and the land. I understand Politics are exactly that “Politics” but to what cost? Today our US legislators left for vacation – I really understand how they could do that. It is an embarrassment. Since the world seems to be going on, and the weather is looking fine for tomorrow – how about joining us for your last chance or those last minuet gifts! Come and down and see us at The LAST (until next year) Providence Holiday Market! 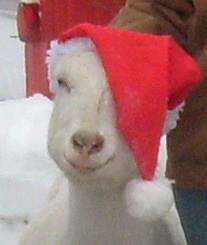 Local Arts, Local Goats fromThe Reynolds Barn – Yes, that means fresh wonderful goat milk soap and scrub! Delicious Local granola from Providence Granola which means a twist of helping folks out as well as yum… Fraggles and Friggles is Local Jewelry to bedazzle, Beautiful Local Wreaths/Greens from Robin Hollow Farm made into beautiful holiday greenery gifts and home decor…and of course Local US – The Botanical Beauties and Beasties. We still have some fabulous Note pads, beautiful Mini Art (cards) a few Wine glasses of our “Marvelous Easy Peasy Ready to go Mug Gift ” sets: 4 Themes-1) Beauty 2) Words 3) Dog and 4) Garden. All have amazing beautiful organic products inside them! Here’s a quick run down: ALL are Dishwasher/Microwave safe 15 oz. 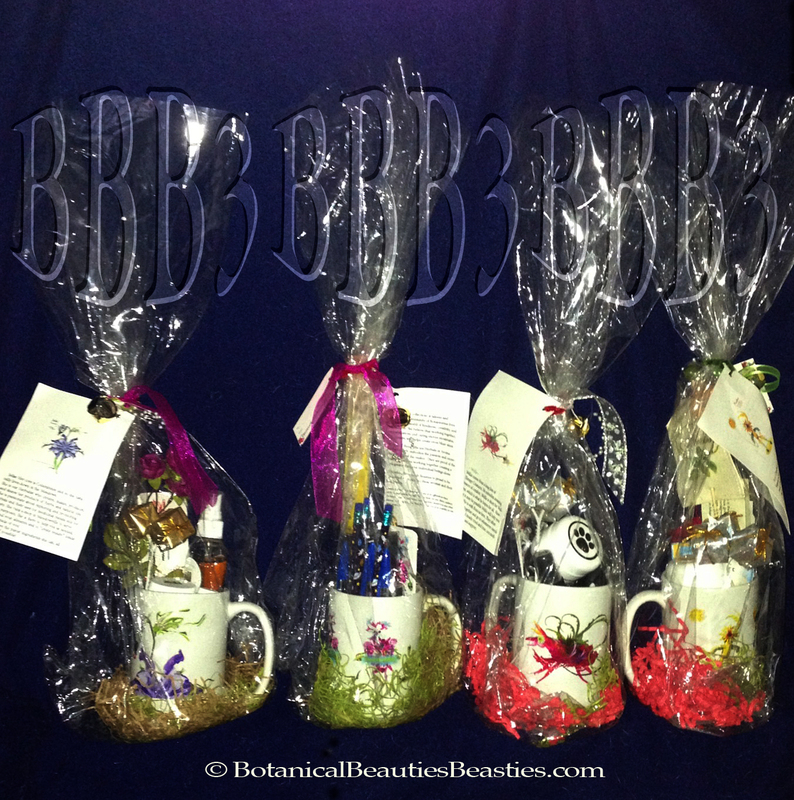 mugs/ have 3 bookmarks/have a gift tag already on them for you/ have a card telling about the Botanical on one side and about community and working together on the other side and a bell to jingle as you give the gift! In addition to that each amazing beautiful LOCAL organic/all natural products that go with the theme. Beauty has skin care, Words has a metal Clarity spray, Dogs have salves for paws and drops for calm and room spray for you and Garden has a most beautiful lavender salve, a luscious cuticle and/or lip butter and a Quartz! Saturday 12/15 – a full market day! The weather outside is to be winter delightful! Crisp and clean – no snow, no sleet that’s all for Sunday! Come on down, join the holiday cheer and fun! Help support Local arts, Local farms and Local entertainers. 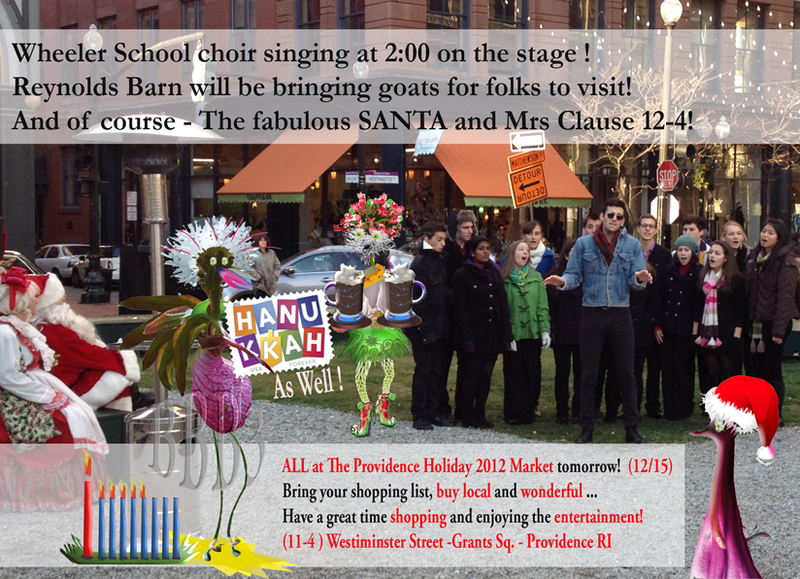 The Providence Holiday Market. The Providence Granola Project – Yum with a great cause too! Jewelry from the Heart Old into New bedazzling wearable art. Oh, and of course US ! The Botanical Beauties & Beasties! – Amazing creations to enrich your day! Art with a message and a story. We are beginning to sell out of some items… so scurry on down for the best selection of the “Easy Peasy Ready to Go, marvelous Mug set” , note pads and holiday cards! Special request still accepted, we just may be able “to deliver” before christmas – ask me! Find us at the corner of Westminster and Union.